I really wanted to enjoy the much heralded “King Charles III” by Mike Bartlett, an unquestionably brilliant playwright of great international repute. The play won the London Critic’s Circle Award for Best New Play, and was nominated for no fewer than six Olivier Awards, four Drama Desk awards and five Tonys. It may be that I have never been much of royal watcher, and thus may have missed some of the subtext, but, alas, I have to vote “nay” on King Charles III, which seems to me a rather tepid cup of tea. The situation develops with comic excess, leading to soldiers and a tank on the grounds of Buckingham Palace, King Charles parading about in full ceremonial dress, a family intervention, and additional complications due to party boy Prince Harry’s dalliance with a commoner. Much of this works quite well. There are certainly many laughs and fine performances, particularly that of Christopher McLinden in an uncannily accurate evocation of Prince William. Michelle Beck is also quite good as Harry’s uncommonly refreshing common paramour. But for this reviewer, the comedy never quite gels. It seems as though the actors are unable to go over the top: Robert Joy’s King Charles III is never quite mad or out of control enough; Camilla never quite mean and manipulative enough; Harry not entirely wasted; and so on. Nor are the various political flacks who buzz about the palace sufficiently discombobulated. In my view, the play calls for the kind of over-the-top outrageousness suitable for playing the outre farces of Joe Orton, but instead is delivered with an exaggerated British restraint which is perhaps intended to be satire, but comes off as unnecessarily dull. This dullness may be the result of the actors having to struggle with playwright Bartlett’s iambic pentameter. The rhythms are impressively correct, no doubt, but Bartlett is no poet and his pedestrian feet do more to hinder then help his comic genius. Go to see what all the fuss is about, and enjoy some intelligent and polished acting, but you may find that “King Charles III” does not quite live up to its hype. “King Charles III” continues at A.C.T.’s Geary Theatre through October 9, 2016. For further information, click here. “King Charles III” by Mike Barlett. Pesented by A.C.T. in collaboration with the Seattle Repertory Company and The Shakespeare Theatre Company. Diretor: David Muse. Scenic Design: Daniel Ostling. Costume Design: Jennifer Moeller. Lighting Design: Lap Chi Chu. Original Music and Sound Design: Mark Bennett. Movement Director: Lisa Townsend. 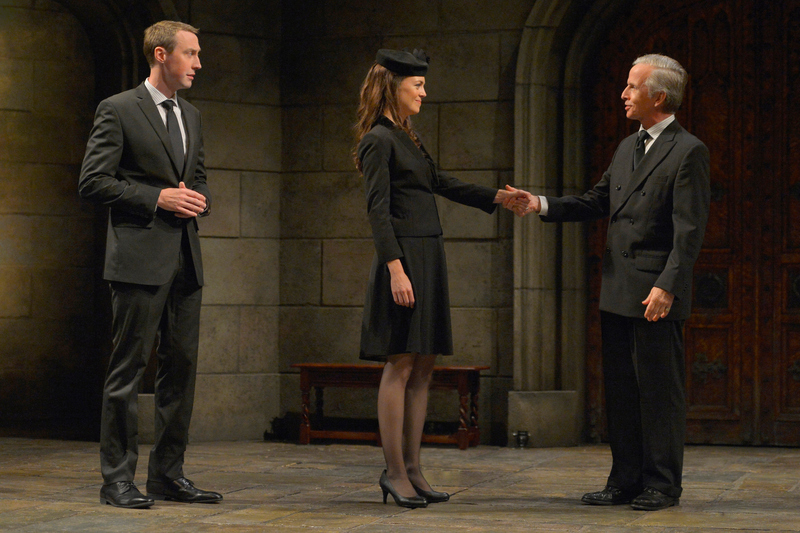 King Charles III: Robert Joy. Camilla: Jeanne Paulsen. Prince William: Christopher Mclinden. Kate: Allison Jean White. Prince Harry: Harry Smith. James Reiss: Dan Hiatt. Prime Minster Evans: Ian Merrill Peakes. Spencer/Kebab Seller/and others: Rafael Jordan. Cootsy/Sir Michael/and others: Jefferson Farber. Jessica: MIchelle Beck. Mr. Stevens: Bradford Farwell. Ghost/Newspaper Woman/and others: Chiara Motley. Speaker of the House/Sir Gordon/and others: Warren David Keith. Ensemble: Lauren Spencer, Patrick Russell. Posted in Reviews.Tagged A.C.T., Charles Kruger, David Muse, King Charles III, San Francisco Bay Are theatre reviews, theatrestorm.